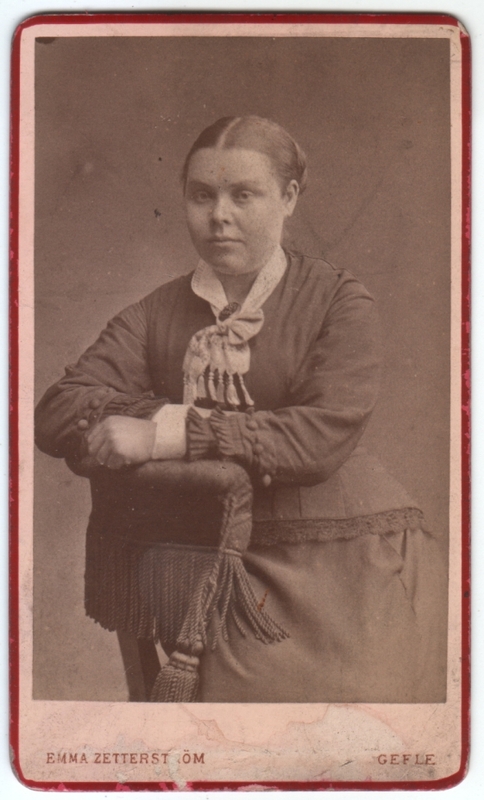 Carte de visite (CDV) photo slightly less than 2.5 x 4.25 inches. Photographer is Emma Zetterström of Gefle (now spelled Gävle), Sweden. Otherwise undated and unidentified. Not much to say about this one, besides the fact that it’s nice to see the apparent work of a female photographer from back then. Basically I was on the train the other day and I saw a young woman with exactly this face, and I recalled seeing this face in my collection, so I dug it out. Simple as that. 29 Feb 2012 at 11:59 am M.O. How nice that a young lady of this age has that intelligent, “old world” face. It’s also nice of you to have remembered this photo when you saw her! I wish she were smiling. She has a lovely look about her that isn’t really highlighted in her dour expression. Yes, she probably lights up when she smiles. Interestingly, I have a CDV from what must be the same historical period, given that the dresses are markedly similar; my lady almost looks related! My photo is a CDV, edged, in red,also, is from ‘Fran Ogrens Fotografiska Atelier’ with the name ‘Falkoping’s’ printed inside an artist easel, and ‘Ternbaus Station’ printed below. Exact same post, exact same hairstyle, could be a twin almost. Isn’t it amazing how sometimes we feel we “know” these faces? And who knows, maybe they are related somehow. I sometimes wonder how much it is that similar clothes or hairstyles make me think these people look more similar than they actually do, particularly when it’s a period look I’m not accustomed to looking at. 3 Mar 2012 at 12:59 pm M.O.